Each person has the potential to journey toward wholeness, toward hope, toward finding their way home. The choice we make can lead us to our life’s Destiny. Stephanie’s story will leave you moved…and changed. Many people–whether victims of physical and emotional abuse, trauma, injustice, oppression, or merely those who have lost their way–go through life facing one of the worst threats known to humanity: hopelessness. When hopelessness arises, often only two paths are open: some people sink into apathy or denial, believing there is nothing they can or need to do to address the hurt within. Others seek help, but the counselors with whom they meet cannot truly empathize with their experiences and do not offer the unique hope found in Jesus. Fortunately, there is a better way. Stephanie Fast believes God’s heart is for everyone to know and experience His Destiny for them. Abandoned and left to die, Stephanie was rescued through adoption. Destiny offers a message of hope and healing found in Jesus. 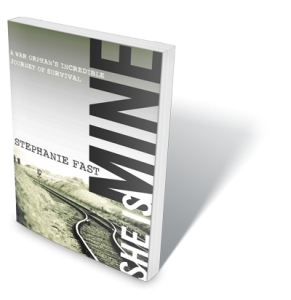 Although Stephanie experienced first-hand some of the most extreme abuse and neglect, she believed she had been created for more. She inspires people to yearn for an understanding of God’s design for them. Stephanie’s mission and the mission of Destiny is to vulnerably share Stephanie’s childhood story so the listener and reader will be moved to take action. If you are moved to support a cause because of Stephanie’s voice, please contact us. We can help you find a credible organization to be involved with. You can also support Stephanie and Destiny by clicking the “Donate” link at the top of this website. As a former orphan from South Korea, Stephanie is passionate about advocating for and helping orphans around the world. Orphans in Asia are particularly close to her heart. Stephanie and her team have begun a series of investigative trips to Asia to discern how best to aid orphans and those working with them. Whether through the establishment of permanent homes, medical clinics, or agricultural assistance, all avenues are being investigated. Stephanie has traveled extensively to speak on behalf of orphans. She also regularly speaks at women’s retreats and conferences, church services, and schools. Her insights and experience are an encouragement to all. In addition, Stephanie mentors adoptees of all ages, as well as those who have not been adopted, to navigate crisis points in their journey. Click the button below to see a list of possible speaking topics or to learn more about mentoring. Stephanie is a voice helping people see each orphan as an individual person. The orphan crisis is not something distant and unseen. It is a reality. Stephanie acts as an orphan advocate with special support for orphans to be placed in permanent homes, either in the land of the orphan’s birth or through international adoption. She relentlessly advocates for the security of permanent belonging for each orphan. To help Stephanie further her efforts, click the button below to make a donation.